A ball gown I made for the lovely Stéphanie. Or, rather, that we made together. She drew the first sketches, I made the pattern, cut it and did the fitting, she did all the boring work like hems and long seams and paying for the fabric. The skirt is a full circle, as you see, with a small train that could be ruffled up in the back so she could dance without fear of stepping on it. I’ve heard of the crowds at big sales, but I’ve never really seen them. I tend to avoid those sort of things. But they have nothing on the crowds when a theater sells off their old stage clothes. What they don’t have in trampling of people, they have in general weirdness. Instead of just dresses and trousers and shirts (which they have too, of course) there’s angels’ wings for children, soldiers’ helmets and big fluffy things with too much fabric that you’re not quite sure if it’s a dress, a skirt or possibly some sort of hat. And all of the clothes have sewn-in tags with names of the characters that once wore them. 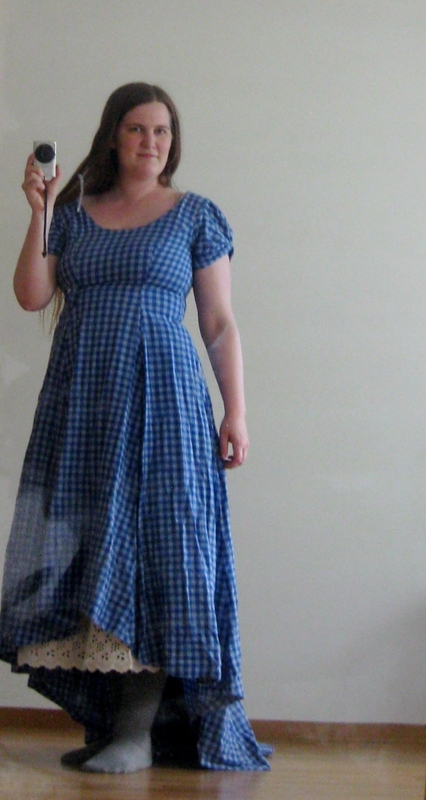 The blue dress I found, for example, once belonged to Gudrun. 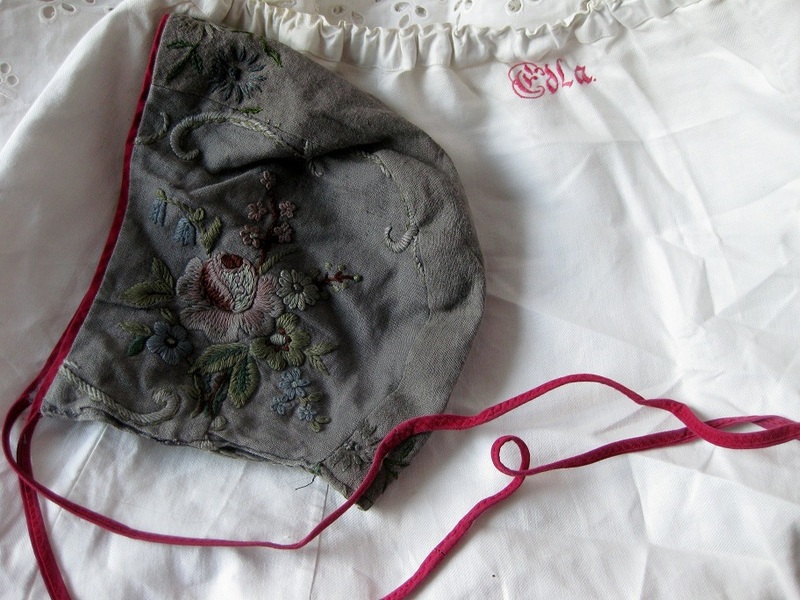 The cute hat was on a hanger with clothes from the play Och sanden ropar. A couple of years ago, I bought a robe called Man with torn clothes. I didn’t buy any of the angels’ wings, nor a helmet (they were all to small), but I found a blue dress, a nice and sturdy petticoat and a very cute hat, among other things. I’m going to the forest tomorrow for two days of camp-building and plotting, and three days of singing, praying and hopefully saving the world. The fictional world of Kastaria, that is. These last two days have been filled with preparations. 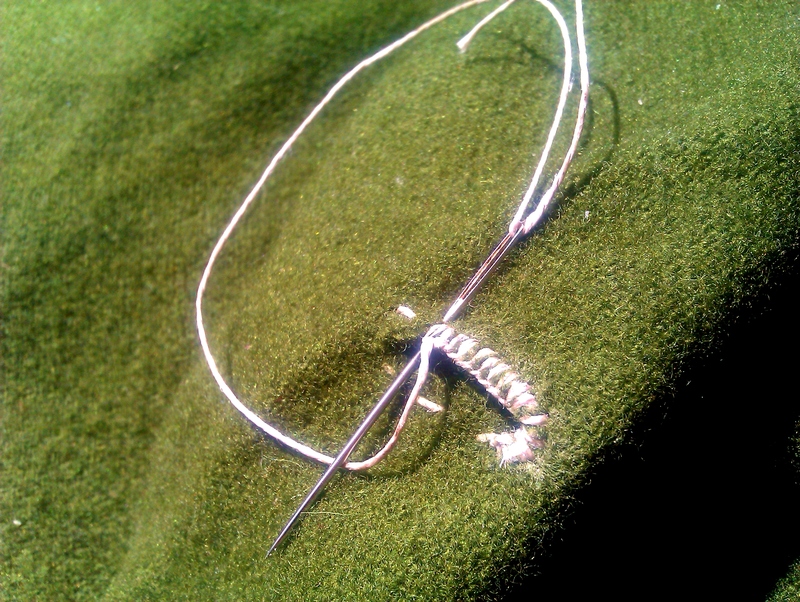 I needed to fix my green wool dress, so now it’s got thirty new hand-sewn buttonholes and five new hand-sewn buttons. I hope to even out the numbers tomorrow, in the car. I’ve written two new songs, and dyed papers in tea (and put them on the bathroom walls to dry, which actually worked surprisingly well) to print song books and a recipe book on. I’ve made toffee that I can give to everybody while we’re in character, and brought chocolate to give to everybody while we’re out of character. Both me and my character really believes in solving everything with sweets. This is a book I made in my first year in Leksand. We had just learned stitching over ribbons stretched across the spine, and I wanted to combine it with the ribbon-weaving I’d learned the previous year at Mora Folkhögskola. All my weaving equipment was packed in boxes somewhere (still a often-encountered problem for me, whatever the subject), so I made my own using cardboard (If anybody knows the English name for this thing, please tell me. I call it bandgrind). I let three warps run parallel with a few centimeters’ space between them, each one about half a centimeter wide. I punched holes in the paper with the same spaces between them. After weaving a couple of decimeters of the ribbons, I started stitching the book. When the thread came out on the spine of the signature, I let it run through the warp, becoming part of the weft. When the book was as thick as I wanted it, I weaved the rest of the warp. The cover is embroidered with one of the threads I used for the ribbon, with holes punched in it that the ribbon passes through, thus securing the cover to the bookblock. The spine is glued and rounded, which was a bit of a mistake. The brownish glue didn’t really look good on the ribbons. Next time I’ll make something even better. I have an idea about learning tablet weaving – then I could weave patterns, and maybe even letters to form the title of the book! In November 2010 I wrote Drottningens väg (The Queen’s Way) for NaNoWriMo. In April 2011 we had our annual spring exhibition at Leksands Kulturhus. The theme was Från det ena till det andra (From one thing to another). I’d had plans for a book jacket since the year before, and this seemed like the perfect time to make one. So from one thing to another (and another, and another): From my story, to a book, to a jacket and at last (because as I said in post about gifts, I don’t really know when to stop) to a necklace/choker. I could have covered the book in the same fabric that I used for the jacket, but I felt that there would be more of a “transformation feeling” if I just chose a paper very similar to the fabric, and I think I found the perfect one. The book in itself is straightforward enough, leather back with foil print and leather corners, french headbands. Then the jacket. I used fake leather for the back and corners, and printed it with the same machine we use for title prints. I wanted to silk screen print the lining, but since I didn’t have the necessary equipment, I did it with those iron-on papers that you just print from the computer*. This had the effect of making the fabric a lot stiffer, which wasn’t really what I wanted, but maybe looked better than if I had got my will. The “beginning” of the jacket-book (that is, the right side) is lined with the prologue, the “end” is lined with the epilogue, and the ruffle around the cuffs are my favourite parts from the middle. *The word “print” just stopped looking real to me from typing it too many times, by the way. I just realised there’s something missing on this blog. I’ve had books, stories, books, ribbons, musings and books, even a cake (and more books), but I haven’t showed you any of my clothes yet. That has to be changed. Right now. Three dresses for today, I think. The second one is a medieval dress in red linen fabric, made around 2008. I loved it, but then I outgrew it and gave it away. Dyed linen fabric isn’t strictly historical anyway. The belt and bag is also made by me, of course. The third one is a medieval dress that I will never ever part with, even if it’s slightly to small now (I do love baking). Wool with buttons in the same fabric. It’s not as horribly warm as it sounds, and as you can see, I can open it and let it hang loose over a belt if it gets too hot. (That picture is from a LARP, so the scared expression belongs to the character).